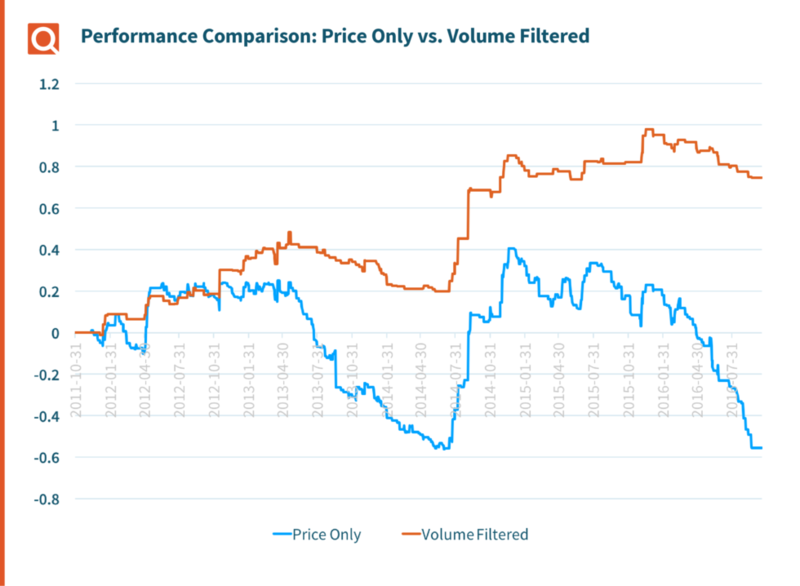 This alternative data in action post looks at the power of currency volume data. CLS has just published the first true global foreign exchange (FX) volume database. Commercially available for the first time via Quandl, this database is the most accurate, most comprehensive and timeliest gauge of currency trading volume ever published. In this post, we present the results of augmenting a well-known FX trading strategy – Bollinger Band breakout – with data from our CLS Daily FX Volume database. This database, along with the CLS Hourly Volume database, offers access to the broadest set of executed trade data in the FX market. This is the first time we have been able to incorporate volume data into an FX trading strategy. The price of a financial asset is, precisely, what market participants are willing to pay for it. If there is insufficient supply or demand at a particular level then, with 100% certainty, that price will change. Hence the aphorism “Volume confirms price,” understood instinctively by capable traders across all asset classes. The best systematic trading strategies in global equity markets today leverage volume information almost as much as price data, to the point that an algorithm would be crippled were volume data withheld. However, the same cannot be said of the FX market: this market is over-the-counter (OTC) meaning volume information is simply unavailable to most participants. Compared to their peers in equity, FX traders fly blind. Now, thanks to CLS’ volume data, we can explore what happens to a systematic FX trading strategy if it is imbued with volume information. Trends are trivial to spot in hindsight. The art and science of trend following (aka momentum investing) requires an investor to detect a trend in its nascence. How exactly to do this is the stuff of passionate debate and indeed what separates the best investors in the world from the rest of us. For the purpose of testing the marginal impact of volume data on FX trend following we chose the classic Bollinger band breakout strategy. This approach is too simple to truly deliver good results in practice, but our purpose is to explore the marginal impact of volume information on systematic FX trading. So we just needed a baseline. Bollinger Band breakout is a well-documented trend following strategy. The basic idea is that a trend begins if the price of an asset moves outside its recent price range. The “recent price range” is defined as its current price plus or minus some linear function of its volatility. An investor buys (or short sells) the asset when a breakout occurs and holds the position as long as the price remains above (below) the simple moving average (SMA) of its price. John Bollinger’s site is the authoritative source on this strategy. The flat periods correspond to times with no breakouts. Note the performance is poor. It is in fact better with different parameterizations, but we felt it prudent to use canonical parameter choices. What we really want to find out is what happens if we augment this strategy with volume data. Volume promises to be helpful in a trend following strategy because the fundamental challenge of the strategy is avoiding false starts. Incorrectly concluding that a trend has begun will, at best, create unrewarded volatility and at worst lose money. This is where “volume confirms price” comes in. We can now finally use volume information to increase conviction around trends with the CLS Daily database. We can augment our trading rule to require not only a price breakout but also a meaningful increase in volume at the same time. If volume does not “confirm” the price, then we stay out of the trade. The average annual return increases to 14.8% and the Sharpe ratio to 0.77. It’s better. We reran the backtest for various values of these three parameters. For N we tried 22, 32 and 42. For M we tried 1, 2, 1.4, and 1.6 and for Z we tried 0.8, 1, 0, …, 2.4. This resulted in 3 x 3 x 9 = 81 permutations of the strategy. Some of these 81 permutations are big winners and others are big losers in terms of returns and risk-adjusted returns. But here’s the amazing result: In 77 of 81 permutations, the volume-augmented variation of the strategy delivers higher risk adjusted returns (in Sharpe ratio terms) than the pure price strategy! Across these 81 permutations the average return of the volume-augmented approach is a full 10% higher and volatility reduces by over 50%. The above is not a rigorous analysis. But it is nonetheless an endorsement of the power of FX volume data in systematic currency strategies. We continue to dig deeper into this data as do a growing list of buy side subscribers. While our hedge fund customers won’t tell us why they like the data so much, we feel certain this analysis hints at its power.